3-pin CD- boxes 1 contactset. See below. 3-pin CD- boxes 1 contactset and Rev limiter. 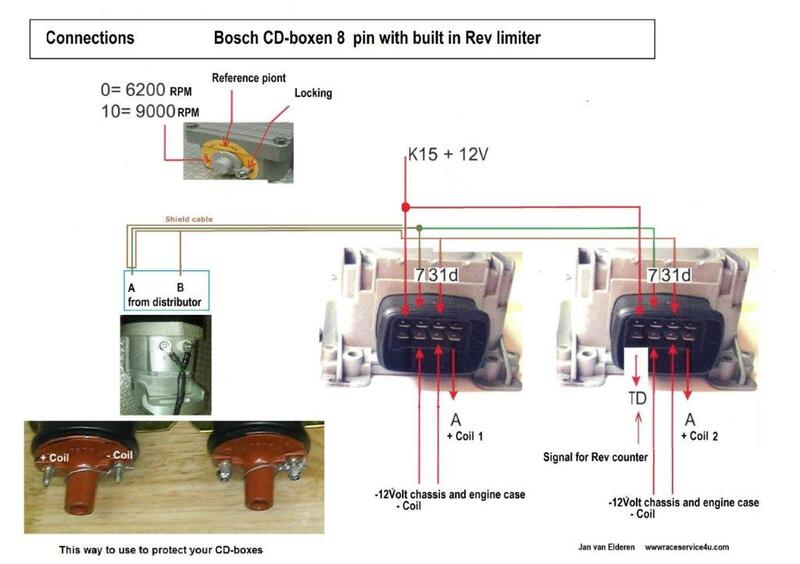 8-pin CD- boxes with built in rev limiter. 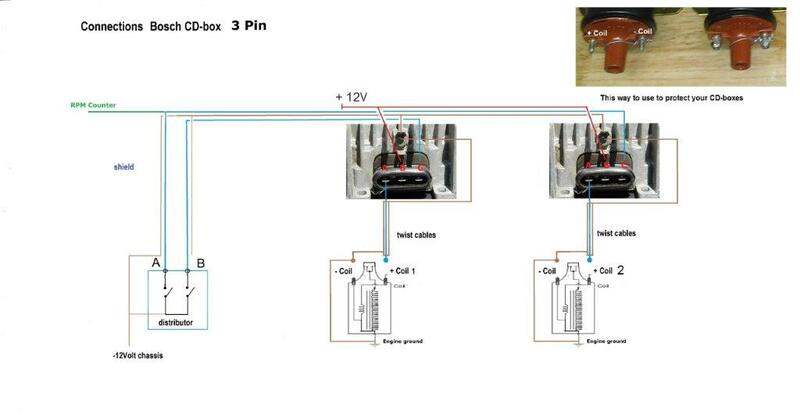 Special Instructions for 3-pin boxes. 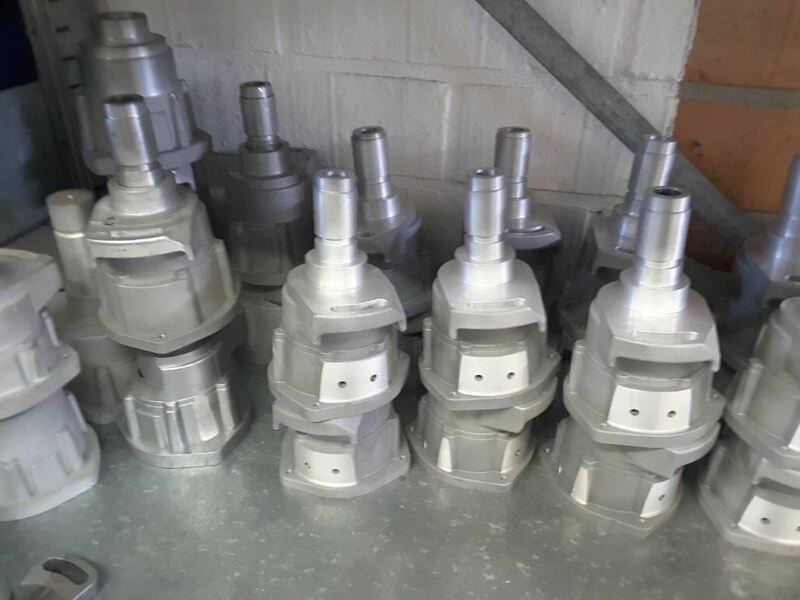 To reduce maintenance and to synchronize ignition on dual plug, dual points ignition systems, both ignition systems can be triggered by the same set of points. 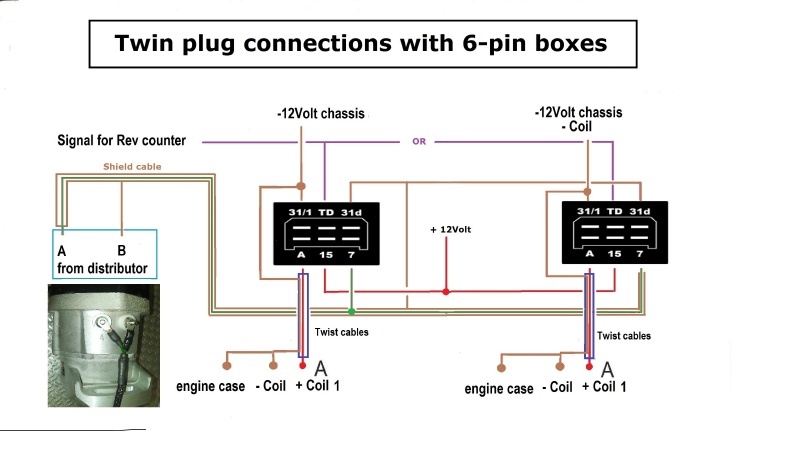 This is most commonly done on Porsche twin plug engines. 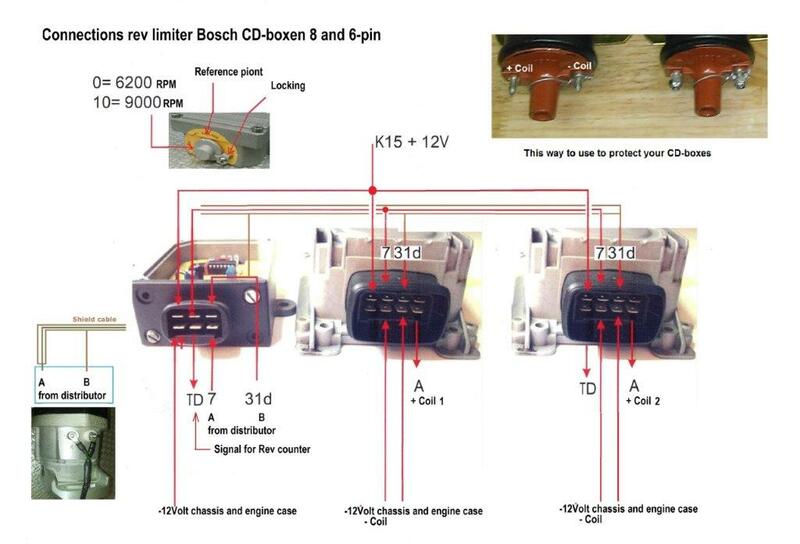 Diodes are required to eliminate feed back between the ignition boxes so that independent control of both upper and lower spark plugs can be retained by the two ignition switches on the dashboard. Refer to the drawing for installation of the diode. Any one-amp diode will work. 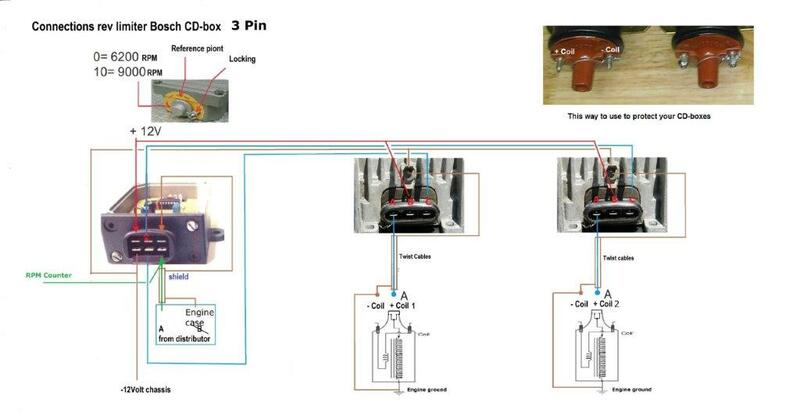 Install the diode in series with each wire to connection C. And with the end of the diode marked with the band on the breaker points as shown in the after picture below. 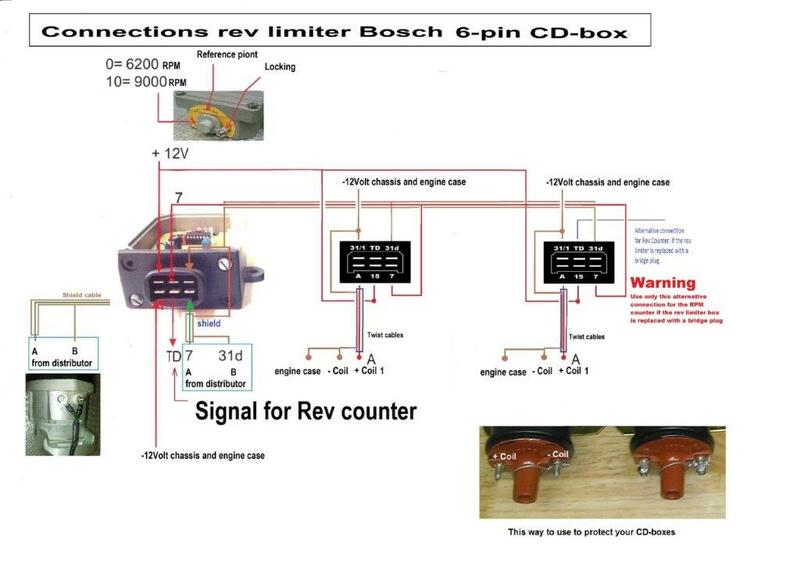 For the 3-pin Rev limiter box. The diodes are built in the rev limiter. Klick on the piture for a bigger one. The impulse will come just after the rotation finger pass the static finger. When you use a twin-plug system for your flat-6 and more than 10:1 compression ratio, experts say the maximum ignition advance must be 25 degrees or less. Raceservice4u experience is that the 911 engines can handle more ignition advance for more power. The raceservice4u engine runs with 33 degrees at high RPMs. We did a test to increase it to 36 degrees and the result was an increase of 4 Kw. We need to do more tests to find the optimum. Fuel was Euro 98 Octaan. Changing the advance curve of a centrifugal advance system is not difficult to explain but not easy to get the right settings. You can change the springs or the weights(blue arrows) to change the advance curve. To change the maximum ignition advance is easier. Bend the stops (red arrows) to the center for reducing the max degrees.